The 17-room classic Georgian colonial home at 42 Alan Lane was designed and built in 1999 by the husband and wife team of Bill Gardiner and Judith Larson of Gardiner & Larson Homes. NEW CANAAN — The award-winning design and construction team of Judith Larson Associates and the Gardiner Group is known for its luxury homes imbued with timeless appeal. The design and build team of the New Canaan-based Gardiner & Larson Homes has collaborated on the designing and building of new homes, additions and renovations since 1995. One such example of their work is the custom-built classic Georgian colonial home at 42 Alan Lane. The 17-room house was built in 1999 for its current owners and serves as a jewel in the crown that is the New Canaan residential landscape. 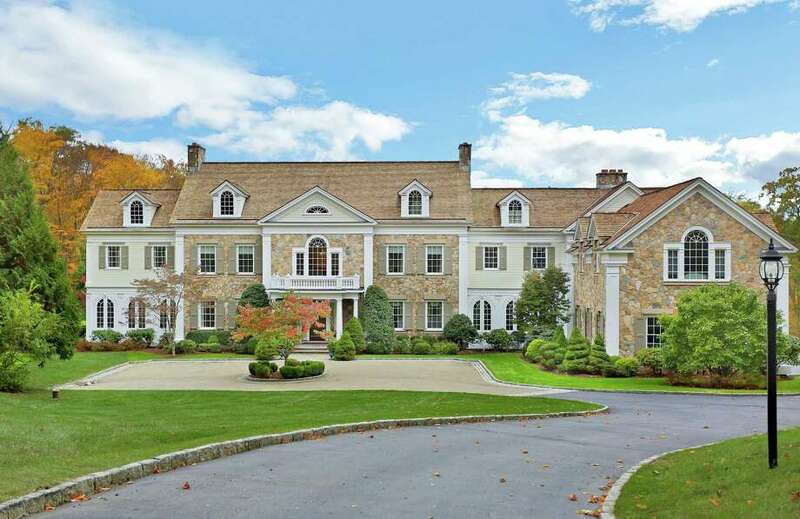 The 12,000-plus-square-foot stone and clapboard house is nestled into its nearly five-acre level, gated estate, which adjoins Laurel Reservoir property ensuring everlasting privacy. The formal rooms on the main living level are palatial in scale and in exquisite architectural and design detail while exuding the warmth and welcoming nature that Larson and Gardiner strive to achieve in all their residential projects. The private rooms are also spacious yet comfortable. Wrought iron gates swing open and bring the owners and their guests down a long Belgium block-lined driveway to the paving stone forecourt and the covered front entrance, which features decorative sidelights flanking the paneled mahogany door. The front door opens into a vestibule that has a coat closet and powder room with a black granite counter and then into the large two-story marble foyer. This grand reception hall has a graceful elliptical arch staircase with decorative carved wood detailing on the skirt board and spiral balusters, and gracefully double- arched entryway into the banquet-sized formal dining room. Also accessed from the foyer is the cherry-paneled library through French doors with beveled glass panes. This room has a marble fireplace, decorative recessed niches, and built-in bookshelves. There is no mistaking this house was intended for upscale living and entertaining. It has not one, but four wet bars, the first of which is positioned between the foyer and dining room. It has a generous bluestone patio along the back of the house, which is accessed from French doors in several rooms. Outside there is a heated in-ground swimming pool and hot tub. The formal living room features a fireplace with a black marble surround and decorative mantel, egg and dart detailing along the box beams, and arched mahogany and glass doors into the conservatory. This light-filled room features a limestone floor with a decorative border depicting a leaf motif comprising imported mosaic tiles. The leaf design is repeated, this time hand painted in the mantel of the fireplace, which has a green marble surround. The conservatory also has three walls of mahogany casement windows punctuated by Doric columns with marbleized painting trim and a mahogany coffered ceiling. In the chef’s kitchen there are many functional and design features including a floor-to-ceiling stone fireplace, a long center island topped in black granite and custom cabinetry with a carved acorn and oak leaf detail, and glass and lattice doors with English turning pilasters and decorative brackets. The flooring comprises white Travertine in a Versailles pattern. Among the high-end appliances are a Sub-Zero refrigerator, two Thermador warming ovens, three dishwashers, and a 48-inch Viking Professional six-burner range. Off the kitchen is an elegant breakfast room and a butler’s pantry. The first of two family rooms is on the other side of the kitchen and features a fieldstone fireplace, built-in cabinetry, and French doors to the patio. The second one is located in the full, finished lower level, where there is also a large game and play room, exercise area, a full bath, and a sauna. On the second floor the master suite is in a private wing and features two baths, a balcony and a large sitting room with a marble fireplace. There are four more en suite bedrooms on this level, one of which has a fireplace. There is also a comfortable mahogany-paneled home theater with raised seating platform and a wet bar. There are additional rooms on the finished third level. This house has plenty of extras, one of which is that most of the house is wired for satellite television. For more information or to make an appointment to see the house contact Marsha Charles of Coldwell Banker at 203-904-4663 or marsha.charles@cbmoves.com.